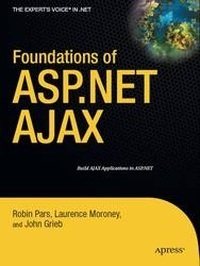 Описание книги Foundations of ASP.NET AJAX:Since the emergence of Google Maps, Ajax programming techniques have become one of the hottest topics in the programming arena. To date, the frameworks available for creating these applications have been complex and have separated the development of the client–side Ajax (on the user’s machine) from the server–side supporting technology (on the company’s machines). This separation has made development slow and difficult. ASP.NET AJAX is Microsoft’s solution to this problem. ASP.NET AJAX (formerly code–named Atlas) is a set of extensions to the existing ASP.NET 2.0 technology that provides you with a fast-and-simple environment to create Ajax applications. Microsoft has combined Ajax with ASP.NET technology and provided a unified set of development tools within Visual Studio 2005. For the first time, Ajax applications can be developed seamlessly in conjunction with a supporting technology.Foundations of ASP.NET AJAX (written by Laurence Moroney the author of Apress successful Foundations of Atlas) gives you a detailed grounding in how ASP.NET AJAX works. It takes you swiftly through the basic principles of Ajax, then deep into the heart of the technology, where every namespace is discussed and every function considered. By the end of the book, you’ll know all the essentials to confidently produce cutting-edge ASP.NET AJAX applications swiftly and professionally. You will not need any reference beyond this book.